John Goddard has been around for so long that few would deny him the title of the grand old man of fly fishing – you name it, if it could be done, he has done it and if he hasn’t done a thing, he knows the people that did it. Which is one way of saying that you get introduced to a hell of a lot of people in this book, which skates around the globe, with the author fishing for carp in an English lake on one page and fighting marlin on the next. Hold on, did you mention the word ‘carp’? I thought that Goddard was a fly fisherman? Well, the answer is that you are right, he is best known as a fly fisherman, but once upon a time he was a coarse fisherman and by all accounts got pretty good at it before the siren song of the fly rod distracted him. Pretty good, that is, apart from when it came to making sure that the maggots stayed in the paper bag under the table at the restaurant, but anyone could make a mistake like that. There is plenty of interest in this autobiography, beginning with Goddard’s involvement in the family firm, Efgeeco, which enabled him to fish more or less as much as he wanted in later years; moving through an explanation of how Trout Fly Recognition came about (incredibly, the impetus was to help tie better flies and the idea of using the images in a book came later) and the stillwater trout years; to a battery of trips to the sort of places most fishermen can only dream about. 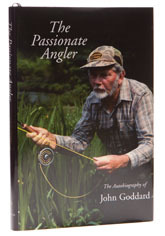 One of the oddities of the book is that Goddard writes very little about the patterns he is so well known for having developed, but this aside, The Passionate Angler offers a fascinating insight into a life I suspect a lot of readers would love to have lived.